1. Bring a large pot of salted water to a boil. Add the linguini and cook until tender for about 10 minutes. Strain the linguini from the water and place into serving dish. 2. Coat Haskell’s Peconic Gold Bay Scallops with olive oil and season with salt and pepper. 3. Place the butter into a sauté pan and set over medium high heat. 4. Once the butter has fully melted, begins to foam, and shows the first hint of the butter browning, place the Bay Scallops in the pan all at once for one minute without moving them. Then use a utensil to roll and turn the scallops around the pan to brown the other side of the Scallops for another 30 seconds. 5. Add the garlic, shallot and cook for about 30 seconds longer until fragrant. 6. Deglaze the pan by adding the white wine and lemon juice and allow mixture to cook and reduce for 1 minute. 7. Drop the heat to medium low, add the parsley, red pepper flake, and stir for 1 minute. 8. 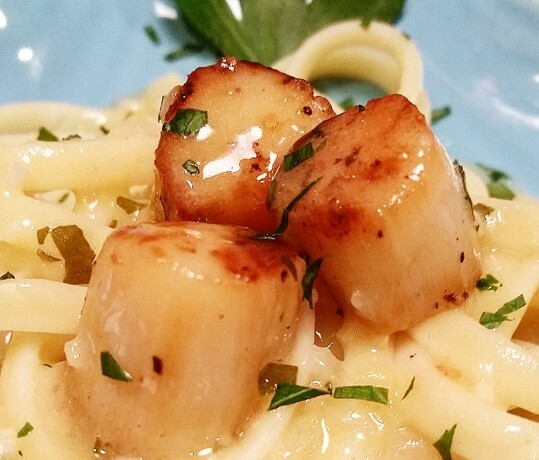 Remove sauté pan from heat, pour Scallops and sauce directly over pasta and serve.